Holocaust survivor Max Glauben films a segment in an interactive green-screen room for the Dallas Holocaust Museum. PICTURE: Courtesy McGuire Boles/Dallas Holocaust Museum. Time has long posed a problem for Holocaust museums. Since the first Holocaust remembrance centres were established after World War II – Los Angeles’ museum, which opened in 1961, was the first in the United States – Holocaust survivors themselves have been the most effective way to bring the Holocaust’s horrors home. – Mary Pat Higgins, president and CEO of the Dallas museum. A hologram is a 3D photograph of a person that, when lit properly, captures the person’s physical presence. Hologrammic films assembled from thousands of these 3D images can bring to a darkened theatre the person seemingly in full: “the way he taps his foot and moves his hand,” said Kia Hays, program manager of USC’s Dimensions in Testimony Interactive Experience, of the hologram of Glauben, which will be unveiled in a purpose-built theater this September. For one, the technology is expensive, costing $US2.5 million to record a single person. The Dallas museum commissioned its hologram of Glauben to help debut a new, elaborately designed 55,000 square-foot home on nearby Houston Street, set to open 17th September as the Dallas Holocaust and Human Rights Museum. In May of last year, Higgins was enmeshed in a six-year campaign to raise $US71 million dollars for the new building, but fundraising was going well enough that she and her board of directors decided to add the cost of the hologram, if the USC Shoah Foundation approved their candidate. About 350 of the questions have been the same for all the survivors. The rest are personalised to each one’s experience. None of the responses are edited, manipulated or changed. 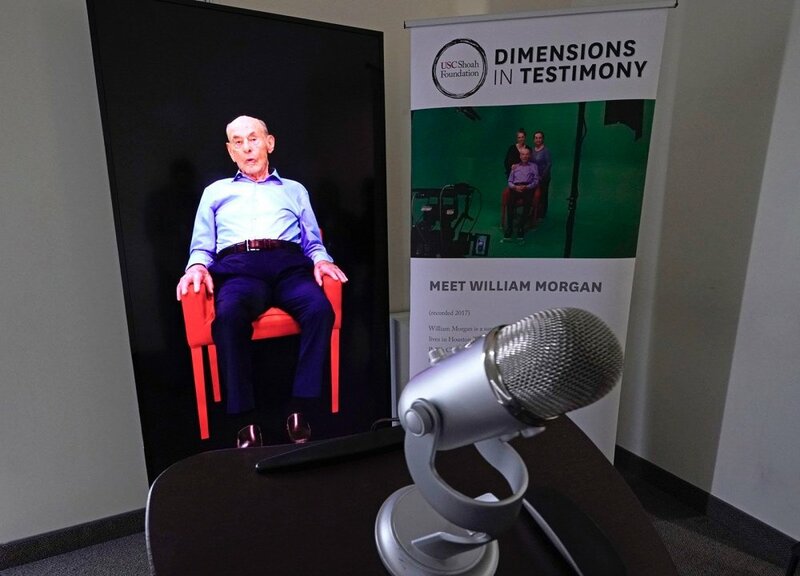 A Dimensions in Testimony exhibit featuring Holocaust survivor William Morgan using an interactive virtual conversation is shown at the Holocaust Museum Friday, on 11th January, 2019, in Houston. 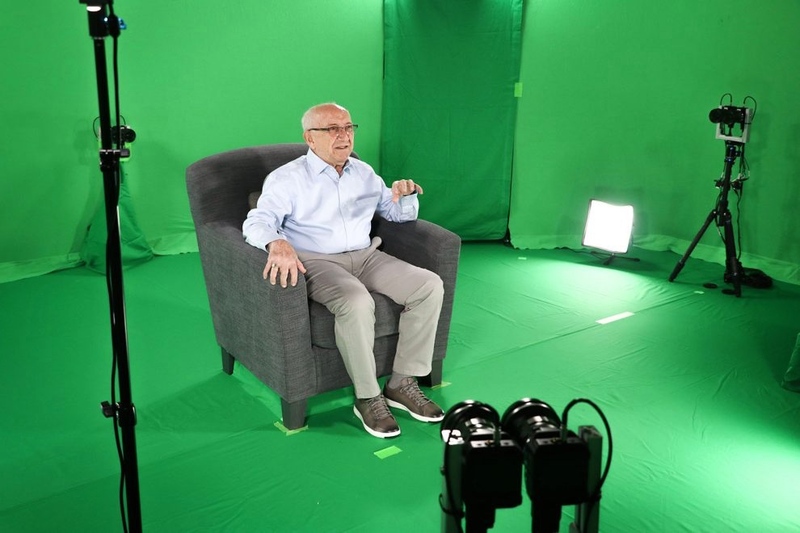 The University of Southern California Shoah Foundation has recorded 18 interactive testimonies with Holocaust survivors over the last several years. PICTURE: David J Phillip/AP Photo. The foundation accepted Glauben last summer, and in August he became their 18th 3D holographic image. Hays said she was struck by Glauben’s “incredible memory” and “incredible personality”. Steven Spielberg founded the Shoah Foundation in 1994, the year he won the Academy Award for directing the Holocaust film Schindler’s List, to preserve interviews with survivors and witnesses of the Holocaust. The foundation houses nearly 55,000 audio-visual testimonies conducted in 65 countries and in 43 languages. But this new technology addresses a unique need – a way of giving the feeling that the survivors are still with us, Hays said. Survivors, Hays said, “are our best teachers”. Meanwhile, Glauben continues to share his in-person testimony with visitors to the Dallas Holocaust Museum Center. On 27th February he addressed a packed room of teens. – Kia Hays, program manager of USC’s Dimensions in Testimony Interactive Experience. After coming to the US as a teenager, he served in the US military, married, worked and had children and grandchildren. He smiled, his face softening when he talked about his family.